Birthplace : Carmichael, California, U.S.
John Patrick Daly Jr. was born on April 28, 1966, in Carmichael, California. His parents, Jim and Lou, had already welcomed two children into the world, a girl named Leslie and a boy named Jamie. John was their third and final kid. Jim, an engineer who built and repaired nuclear power plants, spent a lot of time away because of his job. When he was home, his hours were scattershot. Jim sometimes worked all night, then slept all morning and afternoon. For John, Leslie and Jamie, getting quality time with their dad wasn’t easy. The Daly children turned outward and did their own thing. John’s outlet was golf. He discovered the sport as a four-year-old after his father gave him two cut-off clubs. The youngster loved the sport. To stay close to Jim, the Daly family was often forced to move. Their first change of address—to Dardanelle, Arkansas—came after John’s fifth birthday. That’s where—on a local nine-hole layout—his fascination with golf grew to a passion. John never had many friends as a kid, so golf proved the perfect diversion for him. He could play 18 holes by himself, or hook up with a group to fill out a foursome. His playing companions were just as often adults as they were kids his own age. John was a perfectionist. His golf hero was Jack Nicklaus, and he studied his idol for tips to improve his own game. For John, hitting a clean, crisp shot on every swing was the ultimate challenge. In many ways, John’s game mimicked that of Nicklaus, except for the length of his backswing. From an early age, John took the club so far past parallel that he looked like a contortionist. He would then unload on the ball with all the force he could muster. This produced soaring drives and iron shots that never seemed to come down. As a 12-year-old, John was hitting the ball farther the most men. His clubs—a set of Nicklaus MacGregors—were nothing special. Neither were the balls he used, which he often fished out of a nearby pond. But his game was titanic. He regularly out-drove adults, and posted scores much better than theirs. By now, the family had relocated to Locust Grove, Virginia. John often walked the course at Lake of the Woods Country Club in Fredericksburg. He won the men’s championship there in 1978, which prompted club members to forbid kids from entering the tournament ever again. By this time, John had been introduced to another pursuit that would become a pastime of sorts: alcohol. He downed his first beer when he was eight, and next developed a taste for his parents’ homemade wine. But his real predilection was Jack Daniel’s. It was his father’s drink of choice, and after the 14-year-old’s first sip of the Tennessee whiskey at his sister’s wedding, it became his, too. As a youngster, John also played baseball and football. But golf came to overshadow both. First he gave up baseball, then after a few years of high-school football, he walked away from the gridiron, too. John began to think more seriously about a pro golf career as a teenager. After a short stint in Zachary, Louisiana, the the Daly clan settled into a home in Jefferson City, Missouri. In 1983, as a high-school junior in the Show Me State, John showed he had a rare talent on the links. He captured the Missouri High School Tournament and the Missouri Amateur. The following fall Jim and Lou decided to move north to New Hampshire. They told John he could stay with Jamie back in Arkansas if he preferred. He jumped at the opportunity. His life soon revolved around golf and drinking. Once a good student, his grades dropped as afternoons were spent practicing and playing, and every night seemed to be a party. John’s hard-charging lifestyle didn’t hamper his game, however. He won the 1984 Arkansas Amateur, and the Missouri again, relying on his prodigious distance and surprising touch around the greens. Steve Loy, the golf coach at the University of Arkansas, was impressed enough to offer John a half-scholarship. He accepted, and made his way to Fayetteville. At Arkansas, John majored in golf, with a minor in partying. On the course, Loy liked everything about him, except for his weight. At 5-10, he carried more than 225 pounds. Though John was one of the team’s best players, Loy often put him through the paces. Sometimes, when John qualified for a road trip by out-playing teammates, his coach would make him do something additional, like challenging him to hit a drive in the fairway. John grew to hate Loy. Rather than try to please him, he would purposefully fail. In John’s junior year, Loy demanded that he adhere to a strict diet. If he didn’t, his spot on the Arkansas team would be in jeopardy. John agreed, then found a unique way to shed pounds. He stopped eating as much he had been, and started drinking even more hard alcohol. Always a fan of beer, John realized that Diet Coke and Jack Daniel’s was the ultimate weight-loss method. As he got closer to Loy’s target of 170 pounds, people began telling him how good he looked. In turn, his self-esteem rose, and his game improved. John became accustomed to playing good golf with a healthy buzz on. In the summer of 1987, after his junior season in Fayetteville, John decided he was ready to move on with his life. He quit school, won the Missouri Open and decided to go pro.He also married Dale Crafton. A hand model and the daughter of a prominent Arkansas family, she wanted to live in her hometown of Blytheville. Against his better judgment, John said yes. The marriage was a disaster. John was unhappy in his new home, and the pressure of trying to make a living playing golf was overwhelming at times. In February of 1990, after more than two years of fighting, the couple divorced. By then, John had gone overseas to cut his teeth on the South Africa tour. He acknowledged his return to the singles scene by getting rip-roaring drunk, trashing his hotel room (during which he fractured his right pinkie), then winning a tournament. As was becoming a habit, he took part of his purse and headed straight for the nearest casino. Like booze, gambling was another vice that John couldn’t shake. Two months later, he met Bettye Fulford, a hotel convention planner from Georgia. The two hit it off immediately. Bettye seemed to give John the direction and focus he needed. Back in the U.S. as part of the Hogan Tour, he enjoyed his best season to date on the links, capturing the 1990 Utah Classic and finishing ninth on the money list. The season was marred by a nasty incident during an event in Maine. After a trademark drinking binge, John lapsed into an alcohol-induced coma. He woke up in a hospital bed unaware of where he was. John—who had finished 14th at ’90 Q School—opened 1991 eager to make his presence felt on the PGA Tour. Early in the year he qualified for more than two dozen events but was a non-factor, missing the cut in half the tournaments he played. His most notable moment came in March at the Honda Classic when his drive on no. 15 nearly struck Greg Norman, who was playing in the group ahead of him. Weeks later he embarrassed himself at the Memorial with back-to-back 83s. All the while, Bettye stuck by John. Twice they had planned to wed, but the ceremony was postponed every time John teed it up in a new tournament. As the summer progressed, John’s career appeared to have stalled. He was collecting enough paychecks to feed his drinking habit and buy Bettye a Razorback-red BMW, but stardom didn’t seem to be in the cards. Heading into the last major of the season—the PGA Championship at Crooked Stick Golf Club in Carmel, Indiana—John was hoping for a good-enough finish to avoid going back to Q School. As the tournament’s ninth (and last) alternate, he was lucky to even be in the field. Working in John’s favor was Crooked Stick’s length. Architect Pete Dye had altered the course to 7,289 yards, the second longest in PGA history. For a big hitter like John, the layout was ideal. He could carry fairway bunkers that few others could, and launch wedge approach shots when opponents needed 7- and 8-irons. Ian Woosnam and Kenny Knox fired opening-round 67s to take the Day One lead. John was two back after an eye-opening 69. He seized command on Friday with a 67 of his own. Unknown to the large galleries, John became their larger-than-life underdog. He went after every green, including the one on the 609-yard, par-5 fifth. On Saturday, John went low again, posting another 69. Against all odds, he entered Sunday with the tournament his to win. Bucking convention, John attacked Crooked Stick in the final round like he had all week long. Shooting a solid 71, he cruised home with a 3-stroke victory over Bruce Lietzke. In terms of golf history, his improbable win recalled memories of Jack Fleck beating Ben Hogan in a playoff for 1955 U.S. Open title. The legend of “Long John Daly” was born. The attention heaped on John was startling. His winner’s check of $230,000 was more money than he had ever seen. Endorsement deals poured in. (Within a year, they totalled more than $10 million.) Everyone wanted a piece of him. Voted PGA Rookie of the Year, John was invited to play in the Skins Game with Payne Stewart, Curtis Strange and Nicklaus, where he more than held his own with a $160,000 payday. The strain of being a sudden superstar was really beginning to wear on John. Making things more difficult was the revelation that Bettye was nearly 10 years older than she claimed, that she had previously been married and that she had a 13-year-old son. John ended their relationship, at which point she announced she was pregnant with his child. A short time later, John started seeing a 20-year-old model named Paulette Dean. Bettye, meanwhile, filed palimony and paternity suits against him. In May, after reconciling, they married. A month after that, Bettye gave birth to Shynah Hale. Fatherhood did not settle John down. He continued drinking heavily, and pushing himself recklessly. His golf suffered as a result. Besides ties for 8th in the Nissan Open and second in the Kemper Open, he was having a lousy year. From June to mid-September, he missed the cut in five of nine events he entered. John, however, ended the streak with an impressive victory at the B.C. Open. He concluded the 1992 season with winnings of $387,455. John’s alcohol problems reached a crescendo in December of 1992. During a Christmas party at their new five-bedroom home in Castle Pines, he and Bettye got into a nasty fight. According to reports, after becoming sloppy drunk, John pushed over a big-screen TV, punched a few holes into the wall, then shoved his wife into a wall while pulling her hair. Hoping to clear his head, he drove back home to Dardanelle. John later admitted that he considered suicide during that trip. When he returned to Castle Pines four days later, the story hit the newspapers, and John was arrested for third-degree assault. Under pressure from the PGA—specifically commissioner Deane Beman—John entered Sierra Tucson, an addiction treatment facility in Arizona. The tour also suspended him. He spent 30 days in rehab, but his heart and head were never really into it. Thought John said all the right things publicly, deep down he seemed reluctant to acknowledge he had any sort of problem. John was allowed to resume playing in January of 1993. His game was uneven. But a wonderful performance at The Masters temporarily bouyed him. In his best finish ever at Augusta, he tied for third after firing a 69 on Sunday. From there, John’s game—and his personal life—went into the toilet. Though he registed a handful of decent showings, he was spiralling out of control. John pleaded guilty to misdemeanor harassment in the Colorado case in late May, and was sentenced to two years' probation and ordered to complete a domestic-violence program. In July, he filed for divorce from Bettye, then began seeing Paulette again. Four months later, he flaked out at the Kapalua International in Hawaii. After picking up on the 11th green without holing out, he teed off on 12, which earned him an automatic disqualification. Beman responded swiftly with another suspension—this time with no timeline set for John’s return. Apparently John finally took his situation seriously. He came back to the tour in March, and his fourth-place tie at the Honda Classic suggested he was ready to reassert himself on the course. Six weeks later he won the BellSouth Classic, shooting a 64 on Friday, then holding off Nolan Henke and Brian Henninger. But John couldn’t keep it together. He missed the cut in the U.S. Open and PGA Championship, and was disqualified from the Greater Hartford Open. His biggest paycheck from May to August was $13,150 in the NEC World Series of Golf. In that event he wrestled in the parking lot with a 62-year-old fan who accused him of having deliberately driven his tee shot into the group playing ahead of him during that day’s round. With Beman preparing to suspend him again, John voluntarily left the tour for the rest of the season. The move was too late as far as Reebok and Wilson Golf were concerned. Both dropped their endorsement deals with John, costing him $3.4 million annually. John, meanwhile, continued to struggle on the course. His behavior, however, was much less erratic. Clean and sober—and proud of it—he seemed happier and healthier. In July, when he flew to Scotland for the British Open at St. Andrews, John had no grand illusions. But the weather and the course cooperated, and he found himself leading the championship after 36 holes. Though John dropped to fourth with a 73 in the third round, he came out firing on Sunday. Defying conventional wisdom by powering his driver on one tee box after another, he posted a 71, then watched from the clubhouse with a one-stroke lead. When Costantino Rocca chili-dipped his chip on 18, it looked the tournament was John’s. But the Italian then sunk a 70-foot putt to force a four-hole playoff. Undaunted, John cruised to a four-shot victory. In turn, he became only the fourth American since World War II to win two majors before his 30th birthday. The others in that exclusive club were Nicklaus, Tom Watson and Johnny Miller. His friends on tour were relieved to see John celebrate with a tub of ice cream. While the British Open was John’s only significant finish of ‘95, he ended the year optimistic about his future. That being said, he did little on the tour over the next two years. In 1996 he registered just three Top 10 finishes, as his earnings fell to $173,557. The biggest headline he generated was the firing of his caddie, Greg Rita, who went behind his back and inquired about carrying Tiger Woods’s bag. The following season was even worse. After shooting 23-under at the Bob Hope Chrysler Classic in January, John struggled to maintain any consistency. Not surprisingly, alcohol played a major role in his problems. In March, John imploded in Jacksonville, Florida. After drinking for 14 hours straight, John lost control of himself. Six security guards were summoned to his hotel and labored to subdue him. John then complained of chest pains, and was taken to the hospital. At The Players’ Championship, he went on another binge, and withdrew from the event after a 76 in the first round. John tried to make amends by checking into the Betty Ford Clinic in California. But Paulette had had enough, and filed for divorce. Still, there were plenty of people in John’s camp. In May of 1997, Callaway signed him to a $4-million deal, with an important rider. John was prohibited from drinking and gambling. At the time, he was almost $2-million in the hole with a variety of casinos. Callaway agreed to bail him out provided he kept his nose clean. That was easier said than done. John did open 1998 looking more like his old self on the course. Back-to-back fourth-place ties in March—in the Nissan Open and Honda Classic—suggested he was back on the beam. But a week later he pulled a “Tin Cup” at the Bay Hill Invitational, carding an 18 on a hole after dunking six shots into the water on a par-5. John finished the tourney at +10. Thanks to a couple of good paydays late in the season, John pushed his earnings to nearly $400,000 in ’98. With his expenses mounting—his child-support and alimony payments were more than $30,000 a month—he needed it. All the while, the turmoil in John’s personal life continued. He and Paulette got back together, then split up again. In October, he embraced a new soul mate in Shanae Chandler, who was also in recovery. A journalism student at the University of Texas, Shanae dropped out of school to live with John. By weathering that storm, John gained new support from players and fans. Though his results in 1999 were weak, he enjoyed a different sort of celebrity. People everywhere praised him for his tenacity and courage. He still had his vices, but cigarettes and m&m’s were a far cry from booze and broads. That goodwill soon evaporated. In June of '99, John threw away 26 months of sobriety by downing a 12-pack of beer. That same month he blasted USGA officials for the speed of the lightning-fast greens during the U.S. Open at Pinehurst in North Carolina. Two months later he and Shanae got engaged, then his divorce from Paulette became official. When executives at Callaway learned John was back to his old habits, they demanded he seek treatment from their rehab specialist. John refused and the company severed its ties with him. The 2000 season was perhaps his worst on tour. During one stretch, John failed to make the cut in 10 of 12 events. His finals earnings barely climbed over $100,000. For the first time in eight tries, he didn’t advance to the weekend at the Masters. Off the course, John and Shanae bickered often, including a public display at a McDonald’s in Alabama. Police were eventually called when he began tossing her clothes from their van into the parking lot. Against all odds, John rebounded in 2001. For the year, he won a career-high $828,914, and moved into the Top 50 in the world rankings. The first indication that John was primed for a revival was the 66 he shot in the final round of January’s Phoenix Open. That enabled him to record his best finish since March of 1998. Weeks later, at the FedEx St. Jude Classic, John put himself in contention for the title with a 63 on Saturday. He hadn’t gone that low in 10 years. At the same time, John was trying to sort out his personal life. He met Sherrie Miller, a 25-year-old car saleswoman from Memphis who had a one-year-old son, Austin. Smitten immediately, he broke it off with Shanae. John and Sherrie were married in July. A few months later, John collected his largest check of the year after finishing fourth in the Bell Canadian Open. At the Invensys Classic in Las Vegas, he set the course record at the TPC at The Canyons with a 62. John capped his comeback campaign with his first victory since the 1995 British Open, a win at the European Tour's BMW International Open. Heading in 2002, John’s main goal was qualifying for the field at Augusta. With a pair of top-10 finishes in his first three events of the year, he all but guaranteed his return to the Masters. There, John carded four rounds in the 70’s and tied for 32nd. Though he didn’t do much the rest of the season, he managed to take his record 11th driving distance crown at 306.8 yards, surpassing Calvin Peete, who won 10 titles during his PGA career. John started slowly in 2003, but a tie for seventh at the Shell Houston Open earned him nearly $150,000 and relieved some of the pressure. He also picked up two minor victories, capturing the Korean Open at Woo Jung Hills Country Club and the Callaway Golf Pebble Beach Invitational (for his first win on American soil in nine years). Life looked even brighter when Sherrie gave birth to John Patrick Daly II in July. But things quickly turned ugly. Five days later Sherrie and her parents-—Alvis and Billie Miller—were indicted in Mississippi for their alleged involvement in a million-dollar drug ring and an illegal gambling operation. Though John was not implicated, the news hit hard. In his last seven events of the year, he either withdrew, missed the cut or was disqualified. In addition, Mike Peterson quit as his caddie, stating that he wanted nothing to do with Sherrie. John’s childhood friend and personal assistant, Donnie Crabtree, soon followed suit. The rocky end to John’s 2003 season has made his hot start in 2004 all the more remarkable. His victory in the Buick Invitational in a playoff over Chris Perry and Luke Donald was a classic. On the par-5 18th, he reached the back greenside bunker in two, then cozied up a wonderful sand shot within inches of the cup. When Perry and Donald missed their birdie putts, John tapped in for the win. The cheers that greeted him gave the tournament the feel of a major. Although everyone in golf is rooting for him again, John still has a long way to go. Few will be shocked if he find himself in rehab—or even jail—again. And some fear that one of these days he could wind up on a slab. But it will also come as no surprise if he captures another major. John is a man of extremes...on the course and off it. Everyone knows how far John can hit a golf ball. That’s been his M.O. since his victory at the 1991 PGA. His power is the result of exquisite timing and balance—and an incredibly long swing. Even pros marvel at the consistency with which John strikes the ball. John is a notoriously fast player. According to a study in Golf magazine, he averages 21.1 seconds over putts, 15.6 seconds over irons, and 18.7 seconds over drives. No one spends less time thinking about his next shot. John’s short game may be his strong point. His touch on chips and flop shots is amazingly adept. His putting stroke is excellent. John’s problems start and end between his ears. When he’s focused and in control, he can play with anyone. But there’s no telling when he will explode or implode. John has plenty of good people in his corner—the question is whether he will continue to listen to them. * John’s final round at the 1991 PGA Championship was memorable for many reasons. Before he teed off, he found a note in his locker from Jack Nicklaus that “Go get ‘em John.” Then a rule interpretation almost cost him two strokes. It happened on the 11th green when his caddie, Jeff "Squeaky" Medlen, momentarily rested the end of the flagstick behind the hole as Daly looked at his putt. After television viewers called in the infraction, PGA of America officials decided to let it slide. * After his win at the 1991 PGA Championship, John was invited to kick field goals at training camp for the Denver Broncos. He made all five of his attempts. The Indianapolis Colts offered the chance to appear in an exhibition game, but he declined. * In April of 1994, John took on Jim Dent, then the Senior tour's longest hitter, in a driving contest for $80,000 at the Woodlands in Houston. He blew away his competitor, outdriving him by an average of 24 yards. * John has represented the U.S. in the Dunhill Cup three times (1993, 1998 and 2000). * In 2002, John went to Nashville to record a country-and-western CD. Entitled "This Is My Life,'' it was released the same year. One of the tracks is called "All My Exes Wear Rolexes." Among those contributing to the album were Willie Nelson and Darius Rucker of "Hootie and the Blowfish." He once got a personal guitar lesson from Eddie Van Halen. * John has three children, Shynah Hale (6/10/92), Sierra Lynn (6/1/95) and John Patrick (7/23/03). * John doesn’t like to fly. For tournaments in North America, he purchased a huge RV, which has become his house on wheels. In fact, other golfers, including Davis Love, have followed his lead, and now travel to PGA events in the same fashion. * John gives his time to many charitable causes, including the Make-a-Wish Foundation and Boys & Girls Clubs of America. In 2002, he donated $25,000 to the Nationwide Tour's State Farm Open, which increased the purse to $450,000. * John’s father likes to joke that his son’s favorite vegetable are “the onions and lettuce on a Big Mac." 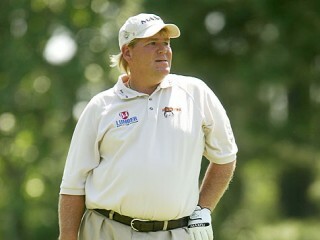 * John’s official web site is www.johndaly.com (with a launch at www.gripitandripit.com). * Besides the instructional books he has authored, John is a favorite of biographers. Two of the more famous titles are John Daly: Letting the Big Dog Eat and Wild Thing: Life on the Edge With Pro Golf's Bad Boy. View the full website biography of John Daly.